The aggregate belt conveying machine is responsible to deliver the aggregate to the aggregate bins. The belt conveying machine uses the steelyard to tighten, and the conveying angle is less than 20 degree, it is safe to work. Besides, the conveying machine can also use the herringbone and grooved adhesive tape or hopper lifting to charge the aggregates, which the conveying angle is more than 20 degree and save the area. The tilting type elevator speed change drum, it realizes electric appliance control which enhanced the productivity and the equipment reliability. The batching system can be equipped with 2 or 5 aggregate bins according to the specific needs. Under the aggregate bin, there is batcher and the belt machine. The aggregate bin could be designed to steel structure, warehouse or half warehouse style. 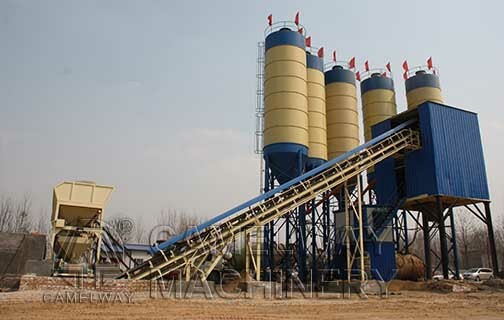 To charge aggregates through belt machine, loading machine and grab bucket and other ways. Under the warehouse, the instrument to detect moisture content in sand could be installed, it is optional.